Personalised photo blanket made in quality fleece, printed and sewn to order. Design your own personalised blankets or make photo collage blanket online. Cuddly fleece blanket covered in your favourite family photos creates a perfect memory blanket or your own special memorabilia to represent a special event and to last a lifetime. Highest quality print, thickest fleece, lovingly made with a long guarantee. 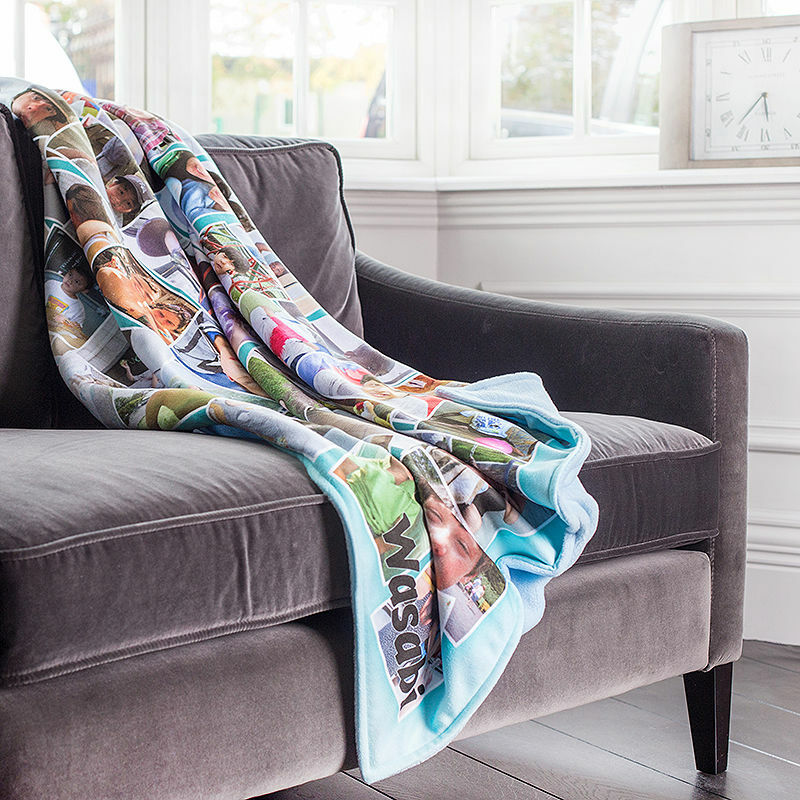 Get snug on the sofa with your custom photo blanket and enjoy the warming hug sensation as you wrap it around your shoulders. Printed with special photos, designs or messages, personalised blankets are a gorgeous gifts which last a lifetime, coming with a 10-year guarantee on the print, fleece fabric and stitching finish. They are handmade to order in four different sizes, each one crafted and stitched with the utmost care and precision, and printed with permanent, eco-friendly inks. Print your photos on both sides and essentially get two personalised blankets in one, or simply print on the face and select from four colours for the backing. Just beautiful. My husband loved it. Amazing quality and super fast delivery. Omg was amazing!!! Defs be ordering again!! Make your own versatile memory blanket, and choose exactly how you want it to look from the size to the backing colour. Instead of creating a photo blanket with one big photo printed onto it, you may want to create an impressive photo collage blanket, covered with lots of snaps and different memories. A photo collage blanket is a great gift idea. Personalised blankets take on an heirloom dimension. 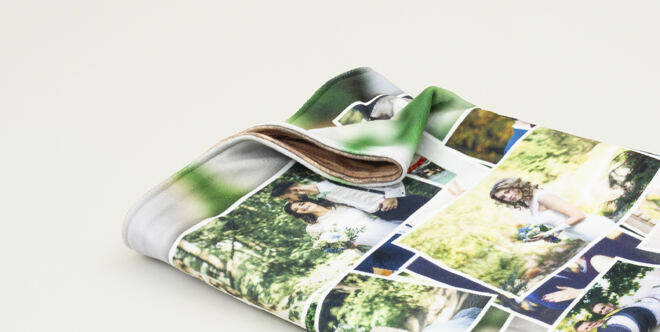 Having multiple images on one photo blanket makes a great keepsake or memory blanket. These are ideal as memory prompters for someone living with dementia. Make family photo collages on custom blankets with our free collage app. Use automated montage styles which randomly scatters your photos across the blanket, or position each photo one by one to create your own style. We are experts at making and printing these meaningful memory products, and select only the best materials and techniques for achieving exceptional print quality. Make a present for someone you love so they can see their family's faces in photos every day, from kids going to uni, to grandparents who can be reminded of their grandchildren always. From birthdays, weddings, and anniversary presents to health recovery, you name it, we make it. Our online design tools will help you achieve the very best results with accuracy. Our workmanship and attention to detail is second to none. When a lifetime of memories are to be made or preserved, Bags of Love will make it happen and usually within a couple of days to your door which is our standard, speedy service. Bags of Love developed the custom photo blanket in 2004 and have made thousands upon thousands of customers happy with our service, sensitive care for the images, and achieving best results through over 14 years of experience. Treat more people to a personalised photo blanket and save money at the same time with our 3 for 2 offer. Simply add 3 blankets to your basket – featuring the same or different designs, it's up to you – and the discount will be applied automatically. Your unique photos, text or designs are printed onto the surface of the fleece, where the eco-inks are fused deep into the fibres, guaranteeing the colours and quality won't fade over time. If you've chosen a single sided photo blanket, choose from either a soft pink, baby blue, black or cream backing. Next, two layers of 285gsm polar fleece fabric are printed and hand stitched together by our expert seamstresses, resulting in a thick and sumptuous 570gsm double thick fleece, probably the thickest available. Care: Your custom blankets are made from responsibly sourced anti-piling fleece, that has a gorgeous plush texture. It can be machine washed at 30°c or lower on a short spin. Leave to drip dry flat or tumble dry on a low heat. Do not wring out. Even with regular use and washing, your photo or designs won't fade, peel away or scratch off thanks to the specialist printing process. That's why we offer a 10-year guarantee on the print life, quality of the material and stitching finish. In times of need or sadness, having personalised photo blankets printed with happy memories can help to uplift spirits and put a smile on your recipient's face. You can even add text, reminding them how loved they are so whenever they're feeling down, they can snuggle up surrounded by familiar faces and kind words. Whether you're looking to add an extra special touch to your soft furnishings or need a housewarming present for friends, printing on this gorgeous fleece photo blanket gives you total freedom. Make the most of double sided printing and get essentially 2 in 1. Design each side in a completely different style so you can easily switch up the décor. Whether you use a photo collage or a perhaps a pattern to complement the interior design, the stunning high definition print will guarantee it as a centrepiece of any room. A cute idea is to turn your blanket into a fun, educational resource that your children can take with them everywhere. Print a numbers game, the alphabet, animals, or different colours to help them learn on-the-go. Watch your little ones grow from babies into young adults, with the comfort of their own photo blanket always by their side. Create personalised kids blankets which include their name in the print, to make the little one feel special and more encouraged to participate. Create snuggly personalised blankets to celebrate a special occasion. A milestone birthday, Valentine's Day, Christmas, or even Australia Day. Design your own blanket Australia themed for the patriots, or a selection of festive photos for a seasonal gift. Special, once in a lifetime events deserve memorabilia, so you could create truly unique ones with photo blankets. Ideal cuddling up on the sofa on cooler nights, or sitting in the backyard late into the evening in the summer season.